he fighting in the South began with American victories at Great Bridge in Virginia, Moores Creek Bridge in North Carolina, and Sullivans Island in South Carolina. The British returned to the South in late 1778. They captured Savannah and Augusta. In 1779, a British attack upon Charleston and an American siege against Savannah both failed. The following year, the British captured Charleston and its 5,000 American defenders. This was the largest American loss of the war. Victories at the Waxhaws, Camden, and Ninety-Six gave the British control of South Carolina. s the British advanced into North Carolina, American victories at Kings Mountain and Cowpens frustrated British control efforts. A decisive battle at Guilford Courthouse destroyed one-quarter of Cornwallis' British army and forced his retreat to Wilmington. 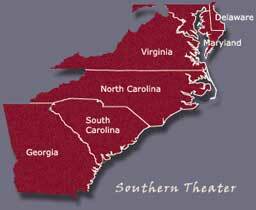 Too weak to continue in North Carolina, Cornwallis moved into Virginia. This allowed General Greene to retake the interiors of South Carolina and Georgia. Following a battle at Green Springs, Cornwallis moved to Yorktown. General Washington and the French trapped him there.